Nassau County Legislator Rose Marie Walker attended the recent Grand Opening Ribbon Cutting Ceremony of "THE SAFE PLACE" located at 15 Grumman Road West in Bethpage. The Safe Place is the co-location of the Nassau County Coalition Against Domestic Violence and the Coalition Against Child Abuse and Neglect. The Child Advocacy Center of Nassau County is also housed at this location. This is an innovative partnership providing programs and services that will serve abused adults and children, providing a faster and easier path to available resources. 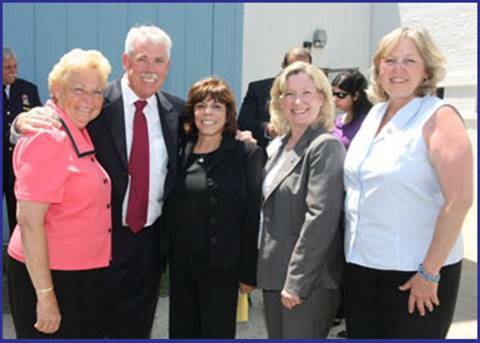 Pictured, left to right: Legislator Walker; Nassau County Police Department DAI President Thomas Willdigg; Nassau County Coalition Against Domestic Violence Executive Director Sandra M. Olivia; Coalition Against Child Abuse and Neglect Executive Director Cynthia G. Scott and Nassau County Legislator Denise Ford.